Pioneer Payroll Services offers a wide array of input, payroll, and report options to our clients. Direct Deposit – This method of pay is convenient for employees. Our system allows employees to distribute money among an unlimited number of accounts. Tax Filing – File all Federal, State and Local returns on your behalf. Complete Pay – Payroll checks are drawn off our bank account, providing confidentiality, security and freedom from bank reconciliation. Check Signing – Checks will arrive signed and ready for distribution. Paperless – Turn off pay vouchers and reports from printing. General Ledger – This interface enables clients to export detailed payroll information, making the input seamless and straightforward. Benefit Accruals – Can be calculated and tailored to your needs. 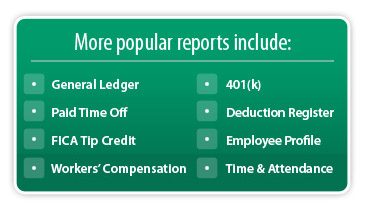 The balances will post on employee pay stubs for easy viewing. Employee Self Service – Allows employees to view and print pay stubs and W-2 forms (after year-end), as well as view a report outlining their pay information and history for a specific date range. Manual Check Writer (gross to net or net to gross) – Enables you to cut a check immediately if an employee needs to be paid early or if terminated employees need to be paid before they leave the building. Report options: Over 800 reports are available, giving you the information you need to manage your business. Payroll reports can be created by any date range and grouped by employee, department, or even location.